The other day I was reading the first few pages of an indie author’s latest book. It was someone whose work I was familiar with, although I had not read anything they had written lately. After just a couple of pages I had an uneasy feeling. Something wasn’t working, like a car whose engine is misfiring. Then I realized what the problem was: cliches. Worn-out phrases. Tired old ways of saying things. You know this territory. It’s the land where brows are always furrowed, shots always ring out, figures always loom, every faces is weather-beaten, straits are invariably dire, storms always brew, and tears are always something to fight back. Technically there is a distinction between a “cliche” and a “hackneyed phrase,” but either way they’re words you know too well. Isn’t a writer’s job to create, to build something new where we usually see something old? But what are we, mere readers, to do about the over-cliche-ization? There is probably precious little … ouch! 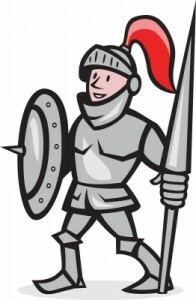 Another worn-out phrase! How about: “there are few options for us.” See how easy it is, when you’re writing on autopilot without really thinking about creative ways to express a thought, to resort to cliches and hackneyed phrases? 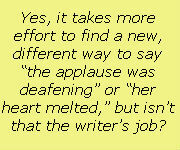 Yes, it takes more effort to find a new, different way to say “the applause was deafening” or “her heart melted,” but isn’t that the writer’s job? The indie authors we select for interviews on The Bookcast are very good at their job. Is it possible to write an entire book without once using a cliche or worn-out phrase? Probably not. In some cases such usage actually provides a useful shorthand way of saying something without getting in the way of the narrative. So, let’s get our favorite authors to join us in the Slay the Cliche campaign. What are some cliches and overused phrases you’d love to see go away, once and for all? Add them to the comments. What a valuable (NOT “awesome”) editorial! Thanks. Also, how can your “head be in the clouds” if your “boots are on the ground”? Thanks for the kind words, Gordon. And yes, there are even cliches the government relies on — “boots on the ground” seems to be the cliche-of-the-day. I’ve slashed away at cliches and, on odd occasions, brought them back. When? In dialog. Sometime an old reliable — even boring — phrase is the right one for the character because that’s how people actually speak. Of course removing the cliches from the surrounding, descriptive text helps make the cliche-ridden dialog ring true. I completely agree with Ms. Korman’s comment. Different voices speak differently, and it is the writer’s challenge to capture those differences.